…Putting the right book in the right kid’s hands is kind of like giving that kid superpowers. Because one book leads to the next book and the next book and the next book and that is how a world-view grows. That is how you nourish thought. A library is many things. It’s a place to go, to get in out of the rain. It’s a place to go if you want to sit and think. But particularly it is a place where books live, and where you can get in touch with other people, and other thoughts, through books. If you want to find out about something, the information is in the reference books—the dictionaries, the encyclopedias, the atlases. If you like to be told a story, the library is the place to go. 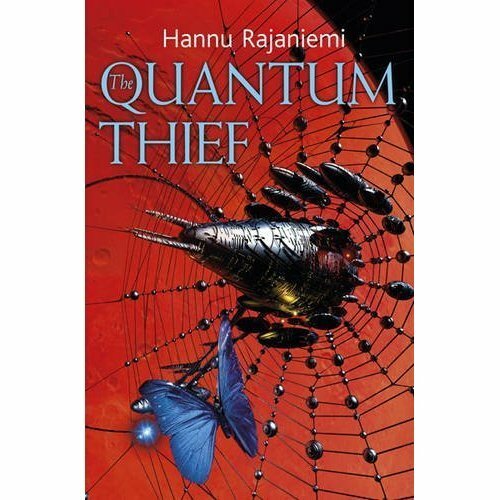 Books hold most of the secrets of the world, most of the thoughts that men and women have had. And when you are reading a book, you and the author are alone together—just the two of you. 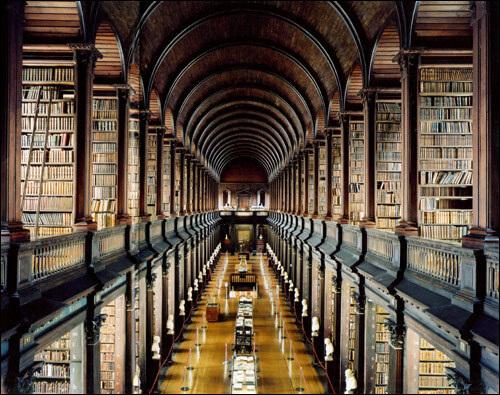 A library is a good place to go when you feel unhappy, for there, in a book, you may find encouragement and comfort. A library is a good place to go when you feel bewildered or undecided, for there, in a book, you may have your question answered. Books are good company, in sad times and happy times, for books are people—people who have managed to stay alive by hiding between the covers of a book. E.B. White in a letter to the children of Troy, Michigan, on the opening of their public library. 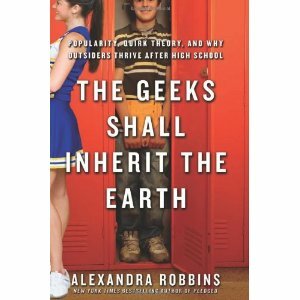 The Geeks Shall Inherit the Earth: Popularity, Quirk Theory, and Why Outsiders Thrive After High School is unlikely to come as a surprise to any adult who would describe their teenage self as a geek. In the book author Alexandra Robbins explains “Quirk Theory”: “many of the differences that cause a student to be excluded in school are the same traits or real-world skills that others will value, love, respect, or find compelling about that person in adulthood and outside of the school setting.” She also looks at how school teachers and administrators may be complicit in propping up conventional ideas of who is popular and who is not. Listen to an NPR interview with Robbins and read the prologue to the book here. Midnight Run, must have watched it 50 times. The most re-watchable film of all time. Also Rhubarb and Custard (As a kid I slept under the animation table at Bob Godfrey Studios on Neal St, still remember Bob doing the voices). I still return to many of Kieslowski’s films, they were formative in my understanding of film. The drum battle where Steve Gadd (he starts at 2.45 in the clip below) launches a stomp attack on Vinnie Colaiuta and Dave Weckl and their supple wrists. Once Upon a Time in the West, which has the single best concentrated set piece scene of any film at any period in history. It is beautiful, epic, speaks truth to humans, society, and history, and I can watch it infinitely. So how about you? What are your culture “comfort foods”? Caveat: I’ve not actually read either of these books so I can’t personally recommend them, but both of them came to my attention this week (thanks to National Public Radio in the US) and seemed like books that might be of interest to BERG blog readers. How did Leonardo da Vinci and Jules Verne predict the future with such accuracy whilst so many others – such as IBM, The New York Times and the US Patent Office – get things so wrong? And what lessons can we take from their successes or mistakes to help us predict the world of 2100? 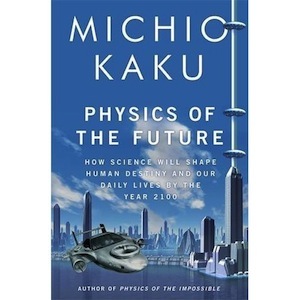 Such questions are addressed by Michio Kaku in his new book The Physics of the Future: How Science Will Shape Human Destiny and Our Daily Lives by the Year 2100 (published in the UK by Allen Lane, May 5th 2011). Read an exerpt from Physics of the Future here and if you have seven minutes, listen to the interview as well where Kaku talks about telepathically fried eggs, identity recognition contact lenses, invisibility cloaks – the technology for all of which already exists, he says – and the fact that in 100 years we’ll think about chemotherapy the same way we now regard bleeding with leeches. 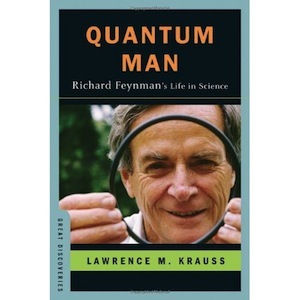 The second book is Quantum Man: Richard Feynman’s Life in Science by Lawrence Krauss (published in the UK by W. W. Norton & Co, April 12th 2011). With this volume, Krauss, himself a physicist at Arizona State University and author of The Physics of Star Trek, has written a biography of Feynman (1918-1988) that focusses on his science more than his personality and, in doing so, touches on nearly ever major scientific development of the 20th and 21st centuries. 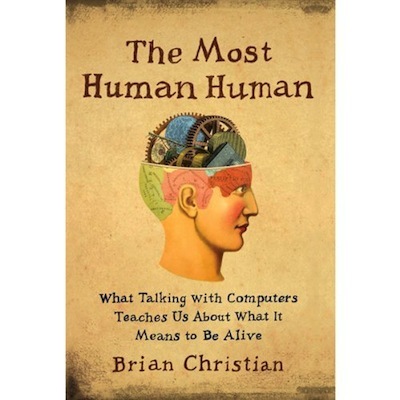 Listen to an interview with Krauss (or read the transcript) from NPR’s Science Friday here. In his opening session at City Tracking, Stamen‘s Eric Rodenbeck showed us this book. 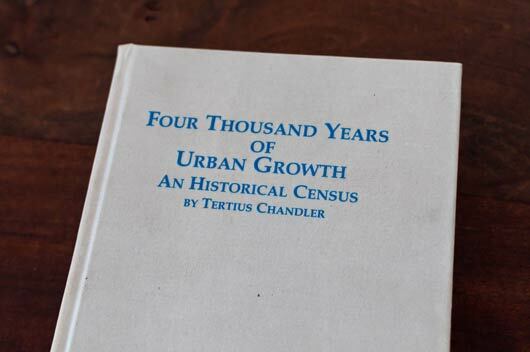 Tertius Chandler’s Four Thousand Years of Urban Growth is a historical census of the world, derived from almost any source Chandler can find. The book sat on the front table in the room we were sharing for the duration of the conference; a constant reminder of cities past and present, fallen and still-standing. 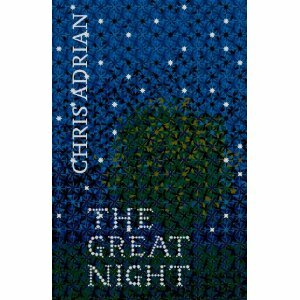 I spent some time skimming through it, and found its contents as marvellous as Eric intimated. 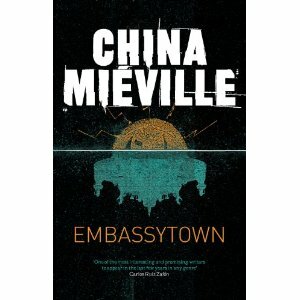 In the first section of the book, Chandler tours the world, listing individual cities and their populations over time. Here’s some of the listing for Dieppe, in France. As well as a running total, there’s a citation for how that figure was derived. Sometimes, it’s based on direct quotation. But sometimes, it’s based on something more like a calculation. For instance, that 1600 figure for population is based on the number of churches in the city, and the average congregation size for those churches. 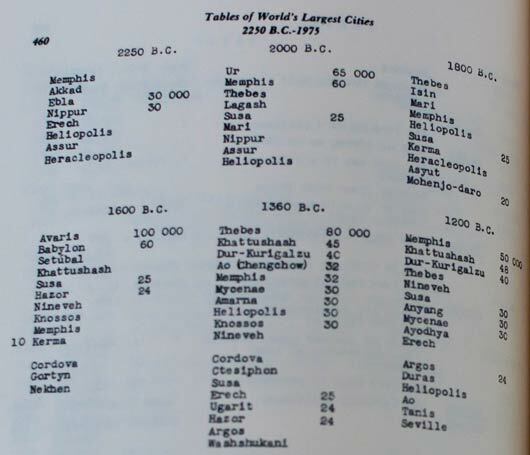 Here’s some of the listing for Baghdad, around the 8th century AD. In 932 AD, he uses several sources: the number of doctors (and how many citizens they served); the number of baths in the city; and the area the city covered. His final figure – of 1.1 million – is closest to the estimation derived from area. 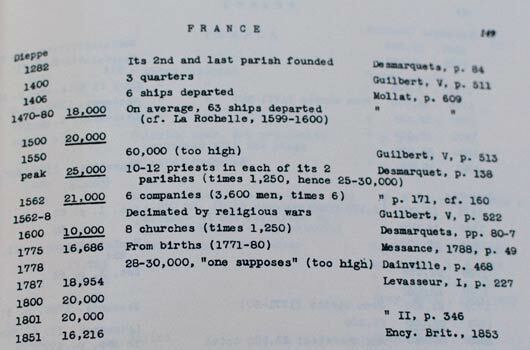 Chandler includes other figures in his notes, even if he’s not comfortable with their accuracy; see, for instance, the “reputedly 2,000,000” in 833, derived from the 1910 Encyclopedia Britannica. Chandler is clearly happier with the more conservative estimate derived from the area in the 1960 Encylopedia of Islam. 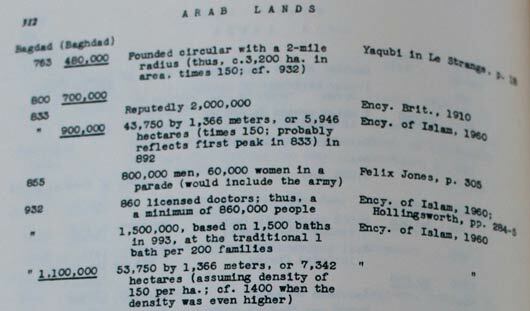 At the end of the book are tables of the world’s largest cities listed by era, with their populations. These are some of the listings for a few thousand years ago. It’s a marvellous artefact that’s now sadly hard to track down. As Eric quite rightly noted, those neat tables are crying out to be digitised in some form. It was kind of Eric to share Chandler’s remarkable book with us (and to let me share it with you) – and as a starting point for two days of talking about cities, it felt most appropriate. As an historian, I dig through found evidence of past decades looking for unseen intersections between technology and design. The two were of course close mutual contextualizers during the mid-century Modern era and incredibly, the untapped historical record of this era is rich and multi-layered: Monthly and weekly periodicals recorded events as they unfolded, catching disinformation and hypotheses along with facts, and a tremendous range of imagery that was never captured in books or annuals as part of the designated record of the era. The most compelling imagery is in industrial trade magazine advertising. 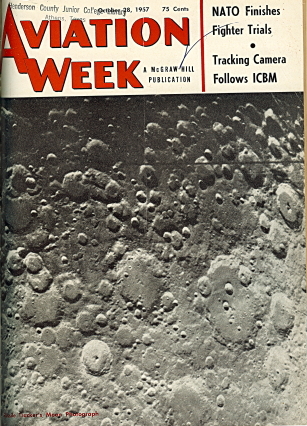 Aviation Week and Missiles and Rockets of the 1950s and 60s, were both published out of the U.S. during the peak of the Cold War. Aviation Week has published since the 1940s and is still a world leader in covering military and civilian aerospace technology developments. 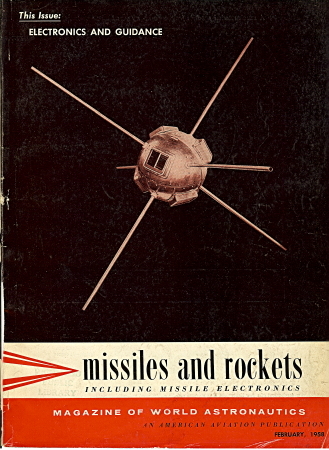 Missiles and Rockets was a short-lived competitor (1956 – 65), whose pages made up for in style what they lacked in tenure. Within the realm of monthly and weekly periodicals, trade publications aimed at working professionals within industry are less examined than their internationally-known general interest counterparts such as Science and Scientific American. Together they offer a body of advertising literature that forms a time capsule of the emerging dynamic between design and technology during the late 1950s and very early 1960s, the peak of technological eruption during the Cold War in the U.S. During those years mid-century Modern design asserted itself within the trade-based advertising literature as a powerful visual language with a killer application. Recruitment advertisements for the Los Alamos Scientific Laboratory in Los Alamos, New Mexico, illustrate a special case of the relationship between Modernism and industry. This is a set of five images appropriated from regional fine painters into service for the recruitment campaign at Los Alamos. The dominant activity of the Laboratory was then, as now, nuclear weapons development. A place seared into public memory by its role as the site of the research and testing of the first atomic bomb, the Laboratory has, since the end of the civil nuclear rocket programs, been mostly a weapons research laboratory. However in the 1950s and 60s there was initiative and federal funding to adapt the atomic legacy to civil purposes. Toward that end Project Rover, sited at the Laboratory, was devoted to the development of a strictly civil-applicable nuclear rocket. The project yielded the NERVA (Nuclear Engine for Rocket Vehicle Application) rocket — mothballed before it was ever tested after political support for it dried up — and the development of small nuclear batteries used in lunar exploration. In those, Laboratory’s program roster included civil space activity as a very large second area of research and development. The dominance of space-related visual motifs in these artworks indicates the widespread prevalence of the civil space program as a leading face of a technological directive that served both martial and peaceful objectives. Between the two World Wars, a fine arts tradition was established and flourished in nearby Taos, New Mexico, founded by both American and European expatriate artists. Members of this group were thousands of miles from the other early modernist painters, yet their work was in dialogue with the dominant themes of modernism. 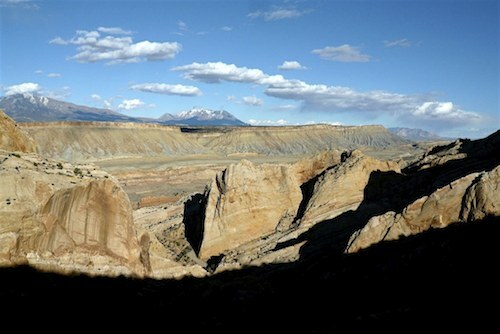 In New Mexico the movement took shape in the emphasis on a spare, sun-dominated landscape expressed in the works of the Taos artists. The form that dominates the center right of the painting, and the lines that attach all the forms to one another, are suggestive of engineering diagrams. Or even internal rocket structure, or just the process of forming connection between one idea and the next. 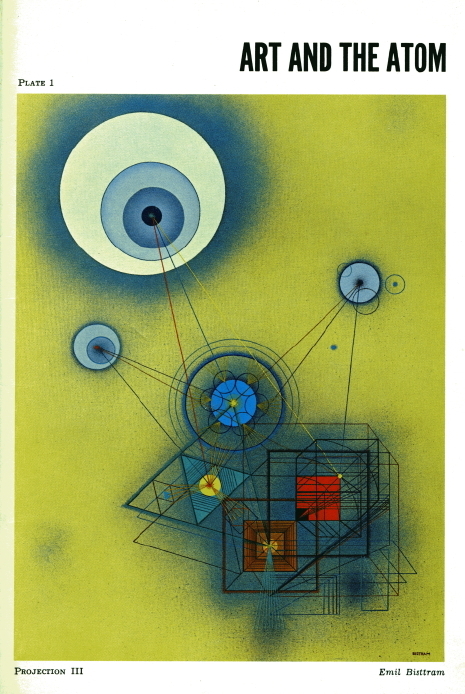 One possible extrapolation, that the abstracted systems/bodies at the top, bottom, and left center of the image represent planets and orbits, is left to the viewer’s imagination. Exhibition catalog, pub. The Stables Art Gallery of Taos. n.d., circa 1963. In the foreword to Art and the Atom, Reginald Fisher, then director of the El Paso Museum of Art, writes that “the semantics of this exhibition revolve around such terms as: space, energy, motion, dynamics, thrust, propulsion, acceleration, curiosity, probe, experiment, empirical, technology, mystery, experience.” He notes that the paintings were selected from pre-existing artworks “on the basis of the capacity of the particular piece to portray symbolically the essence of the research field under consideration [for recruitment].” The remaining historical evidence of this transaction between industry and artist is mute on the question of how the artists felt having their works utilized in this manner, or whether any chose to opt out. The blue spot disrupts the conventionally romantic stylization of planetary or solar bodies by contracting the sphere to its minimal form. Sihvonen here seems to references the early 20th century Russian constructivists, with the prolonged vertical angular shape aimed at the planetary circle. It brings to mind El Lissitzsky’s constructivist graphic composition Beat Back the Whites with the Red Wedge which pioneered the use of juxtaposed triangle and circle as a graphic strategy to represent political conflict. I find it ironic that the graphic legacy of Communist action should be re-articulated and put into service — whether with or without the artists’ sanction — in the service of American Cold War-era weapons and civil space technological programming. The investigation that yielded the discovery of these artworks and their history is part of a larger project: In Spring 2010 Blast Books will publish my monograph Another Science Fiction: Advertising the Space Race 1957–62, which gathers and interprets over 175 advertising images from Aviation Week and Missiles and Rockets. It clusters the advertisements into five subjects, including those that recruit for satellites, for human space exploration, for propulsion systems engineering, and for projects that recast space as a new landscape. Lastly, Mid-Century Modern Space rounds out the book with a longer discussion of industry’s use of modern design in advertising. This essay was adapted from this chapter. The book itself is but one product of the cultural enterprise co-developed by my spouse Rick and myself: The Prelinger Library (http://www.prelingerlibrary.org), a private research library that is open to the public in San Francisco. We are an experimental, image-appropriation friendly library with both analog and digital holdings, including over 30,000 titles and ephemeral artefacts in the areas of media, technology, and landscape and social history. Thanks to BERG for visiting us this past summer! All are invited. I had the privilege of opening Web Directions South here in Sydney, this morning, with a hike through fanufacture, science fiction, social capital, cybernetics, and Neptune. The reception has been great and I totally enjoyed myself! What more can a man ask for. A few folks requested a bibliography, so here we go. You can pretty much reconstruct my entire talk from this. Books and articles, in order of appearance!